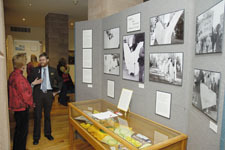 Although the AHC is not a museum, small exhibits highlighting AHC collections are on display throughout the year. A premier collection of Western art is on permanent display in the AHC's loggia and George A. Rentschler Room. The collection includes paintings by Henry Farny, Frederic Remingtion, George DeForest Brush, and Alfred Jacob Miller. A number of our exhibits can now be viewed online, and more will be added over time. Visit our Virtual Exhibits page to start browsing exhibits online. The AHC has a number of traveling exhibits available to museums, libraries, and other institutions at nominal cost. In a typical year, approximately 35,000 people view our traveling exhibits in venues across Wyoming and beyond. To learn more, visit our Traveling Exhibits page.